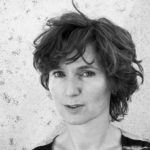 Hélène Gelèns is a Dutch writer of poetry, essays and prose, based in Amsterdam and Antwerp. She undertook an exploration of various academic disciplines, at the universities of Leiden and Amsterdam, ranging from astronomy and Dutch literature to medieval history, eventually majoring in philosophy. Gelèns is the author of three poetry collections, the second of which was awarded the prestigious Jan Campert Prize. English translations of Gelens’s poetry appeared in UK-based literary Magazines such as Ambit, Poetry London and The North.